Velocity Barre is a fast and effective, yet safe method to change your body. In 55 minutes you will achieve a full-body workout concentrating on the areas women struggle with the most: hips, thighs, buttocks, arms, and abdominals. Barre method is low-impact, protecting your joints by avoiding bouncing and pounding movements.Prepare to give your muscles a long, lean look and your problem areas a lift with Velocity Barre…. No ballet dancing needed! 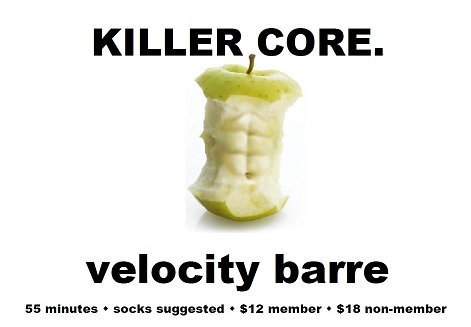 Velocity BARRE is every Wednesday afternoon at 4:40pm. $12 for members and $18 for non-members.